Life on the Run. Okay, walk. I am writing this from northern Spain in the small village of Obanos. The cathedral bells have just rung, temporarily drowning out the conversation of a group of local Spaniards near me in the plaza. The sun shines still though it is 7 pm. 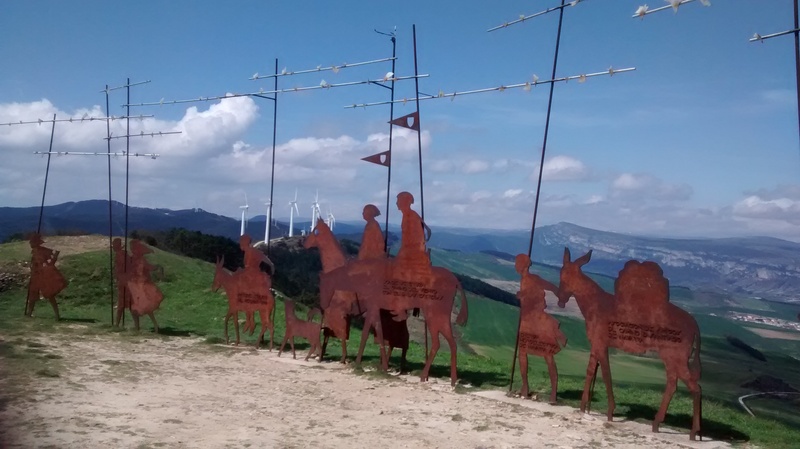 I am on Day 4 of my Camino de Santiago. About 65km down. 725 to go. The challenges are probably obvious: kilometer after kilometer of walking, dealing with wayfinding and the weather, and missing loved ones at home. But there is glory, too, in rolling green hills, snow-dotted mountainsmountains, and the peace of an ever-extending path past grazing sheep, sun-yellow mustard fields, and rushing streams of clear, cold water. More so is the joy of the companionship of fellow wanderers, restless spirits who are open to all that this lovely and difficult world has to offer. They understand like few others what drives me on, the curiosity and faith and wonder all at once. The backpack and sleep sheet have been treated with pesticide. The hat and backpack have been waterproofed. Duct tape has been applied to my heel blister. The proper socks and bras and pants and shoes (oh Lord have mercy, the shoes – I can write six more blog posts on just those!) have been procured. Reservations have been made. Electronics have been charged. And the day has finally come. This evening I’m boarding a plane for the Camino de Santiago. The shell is the symbol of pilgrims to Santiago de Compostela. My favorite story about them says that when pilgrims reached Finisterre (Latin for ‘the end of the world’), which lays just west of Santiago, they would pick up these shells from the beach to prove that they had been there. The ridges are said to symbolize the different directions that pilgrims come from, each to meet at one central point. 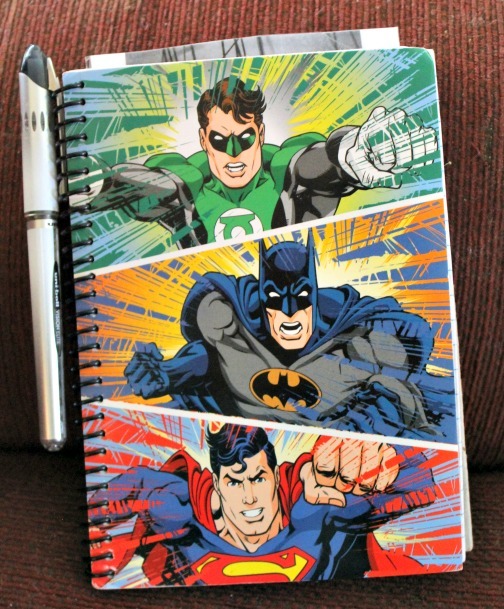 Because I’m a writer and a bit of a weirdo, here is my notebook. Inspiring, right? 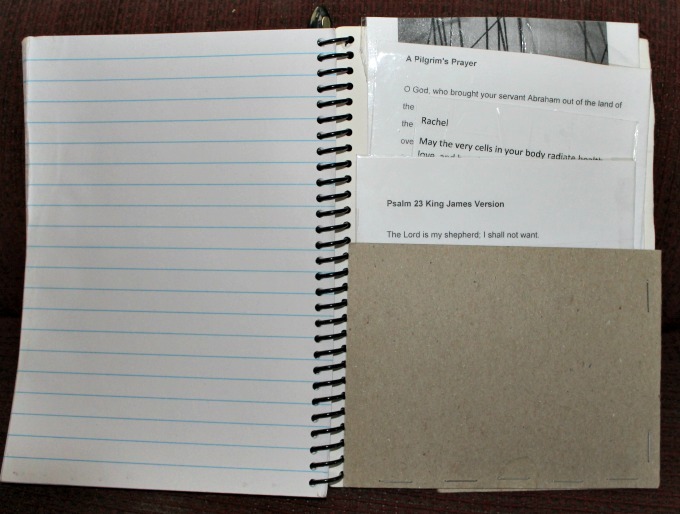 At the back I made my own pocket to carry prayers covered with clear packing tape so that they will last. Thank you to everyone who has gotten me this far – and there have been a lot of you. I am blessed to have so many supportive, kind, loving people in my life. Sara hiked with me every weekend. Helen and her dog Galtee tromped up and down lots of hills with me. Martha gave me a travel hack kit of rubber bands and band aids and plastic bags. Stephanie hugged me. Many, many of you have encouraged me. Calls and well wishes and messages have been coming in. Bucks have been shelled out. Prayers by the dozens are coming my way. Janet is coming with me. Dave has the brunt of work – taking care of my many animals (including the one wearing the cone of shame still) and the house not to mention emotional support. My mom is praying for me. My dad is bragging about me to random people. My daughter is waiting anxiously to hear from me. All in all, I am abundantly, richly blessed, and I will not forget that fact. So thank you again. I’ll see you on the other side.